I went to the mall while my husband was getting his surgery done, to do a little shopping!! I wanted to start getting some Christmas presents and I needed to stop by Lush to get their Halloween goodies!! Lush Bat Heebie Jeebie ~ $17.95. When darkness falls across the land, a midnight shower is close at hand! Take these two eerie sudsers into the bathroom for a seriously spooky wash and emerge smelling truly irresistible. Mishibox is a newer Korean Beauty Box subscription based out of the U.S. - their first box shipped in June. I was so excited when they announced that they would be shipping to Canada for August! I obviously signed up right away! It is really great having more k-beauty subscription boxes available in Canada! Mishibox is $19.99 monthly + $5.95 shipping to Canada. Mishibox always comes in a little pink box and is nicely packaged. Yay for Friday!! Hope everyone had a great week - I am happy for the weekend! This has been a busy week! How cute is this headband? It is the Etude House Lovely Etti Headband! 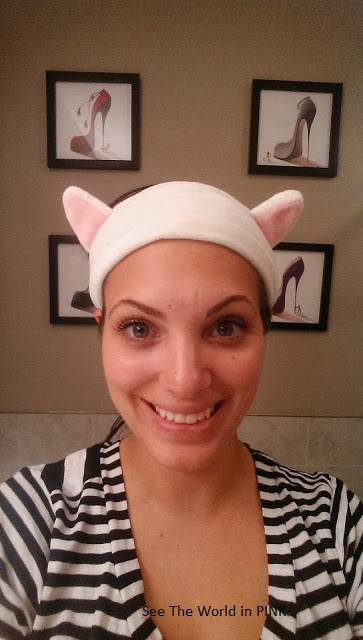 It is so soft and cute - I will wear it every time I wear as a mask! In September, I was honestly so excited when I saw in an article that L.A. Splash Cosmetics came up with a line of lipsticks based off of Disney princesses!! So, then reading that article, I noticed that they had also recently released a Harry Potter inspired lipstick line! How did I not already know about this?! Amazing! How awesome are both of these collections!!! I was so excited to order some! I went to the L.A. Splash website and sadly, they wanted $25 shipping to Canada - I had to do some digging and found All Cosmetics Wholesale that offered $7 shipping which was decent!! I ordered 1 lipstick from each collection - here is a look at what I ordered! LASplash Studio Shine Waterproof Lip Lustre (Matte) - Aurora ~ $13.98. Fairy tales do come true with LASplash fairy dusted waterproof StudioShine Lip Lustre. Specially formulated for a long lasting happily ever after. Yay for Wednesday!! 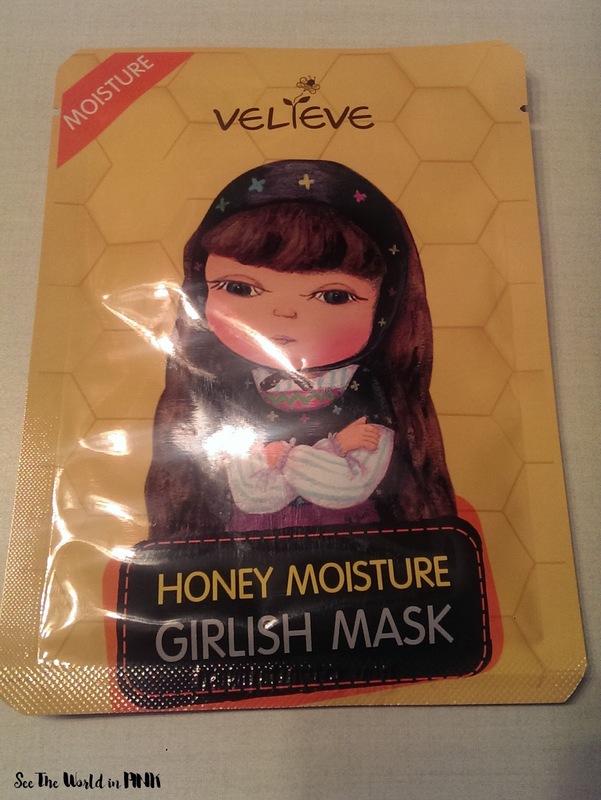 I love my Wine and Mask nights - this week's theme is "honey". How adorable is this packaging?! 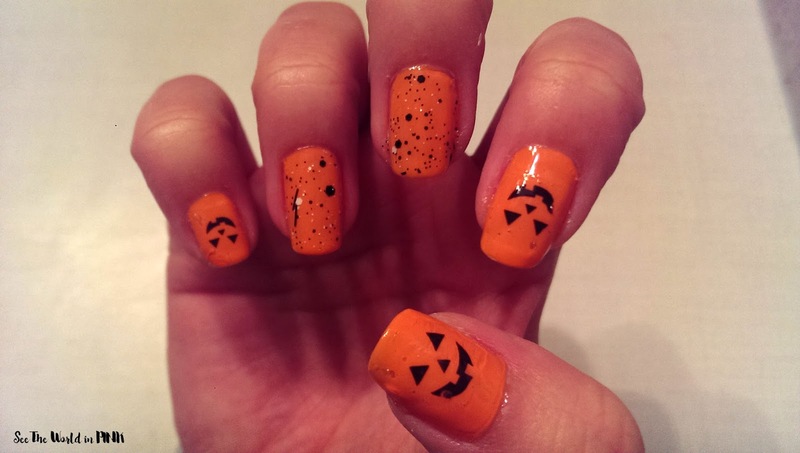 Time for another Halloween Manicure Monday!!! I love everything Halloween and I thought this week that Jack-O-Lanterns would be perfect for the week leading up to Halloween! This month's theme is "Alter Ego" - This October, transform into whoever you want to be. A little imagination and your Glam Bag are all you need. Infinite possibilities, infinite ways to express yourself." The bag is duel-sided, one side is shiny black and the other gold - i'm not really a fan of it, but that's okay I will pass it on. I was so excited when I received the Glamglow Flashmud Brightening Treatment in my September Ipsy bag - I have been waiting patiently (not..) to try it! 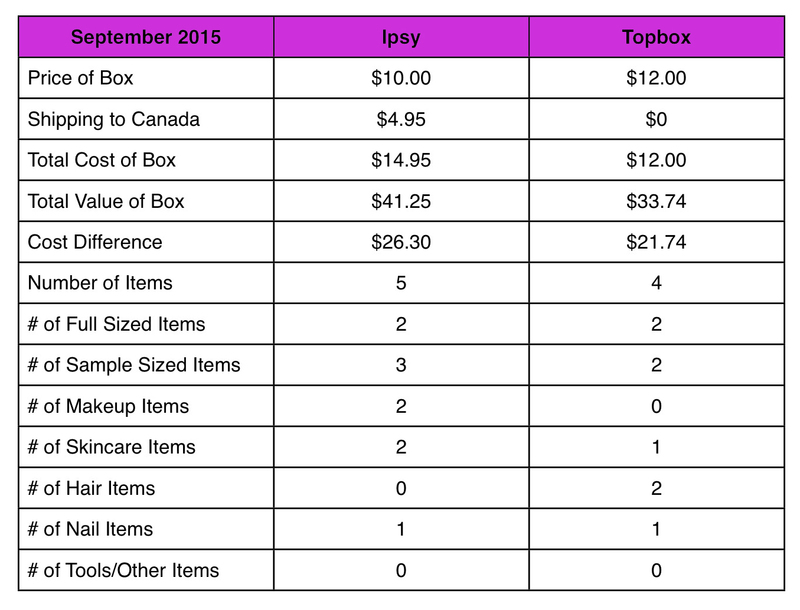 This is my third month of just comparing Topbox and Ipsy - June was my last month of Birchbox Canada and May was my last month of Beauty Box 5. If you are interested in viewing my past comparions, you can go here! This month's theme is "Face Fashion" - Smokier, deeper, richer. This September, leave the past behind and take the leap into fall with a Glam Bag made to inspire the perfect transition from summertime casual to autumn elegance. Hope everyone has had a good week, mine has been a little bit rough this week but still good! I was hoping to get more blog posts up this week as I am STILL playing catch-up from the honeymoon! First order of business this week - my husband went for knee surgery yesterday and I will taking care of him for quite some time!! He can barely move around the house right now, he can't drive for 4 weeks, and likely will not be back to work for 6 months!! I am hoping a smooth recovery for him, but for now I am his home nurse! Fall 2015 - FabFitFun Lifestyle Subscription Unboxing and Review! + $10 off!!! FabFitFun is a quarterly lifestyle box! For $57.99 for Canadians (is US $), (FabFitFun is $49.99 in the U.S.A.) at the start of each season, they guarantee you will receive at least $100 worth of items. (Generally the box has over $200 worth of goodies in it). FabFitFun has been shipping to Canada for over 1 year now and I have been very happy with the FabFitFun boxes - this is one of my favorite subscriptions! I stick to it despite the crappy exchange rate because the value is always there!!! Time for another Wine and Mask Wednesday - this week's theme is Blueberry! yum! Time for another Manicure Monday (so I did these last night and didn't post - I'm really good at that!) 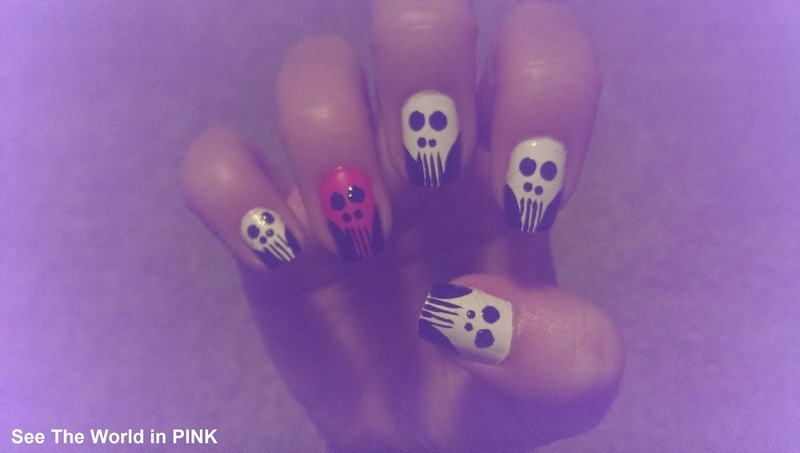 I love doing Halloween nails - this week I am going with skull nails!!! "To encourage women to take time for ourselves, affecting change in our lives. Women are caregivers and nurturers by nature. Having a Me Thyme Experience empowers us to continue to do what we do naturally. It refreshes, rejuvenates and revives our body, mind and spirit." The products contain NO: parabens, phthalates, artificial colors, sulfates or petroleum. They are vegan-friendly and do not test on animals - they also promise the highest quality ingredients that are gentle enough to use on baby skin. Sugar Scrub in "Vanilla" ~ 2 oz. for $10 and 8 oz. for $20. Our Sugar Scrubs, slough away dead skin cells – allowing your skin to soak in the nutrients of Me Thyme’s Body Butter and Lotion. Your skin will feel smooth and soft – simply radiant. Time for another Five on Friday - this week has flown by! It is hard to believe the holiday is over and I have been back to work for a week already! Our honeymoon in Turks and Caicos was absolutely amazing! 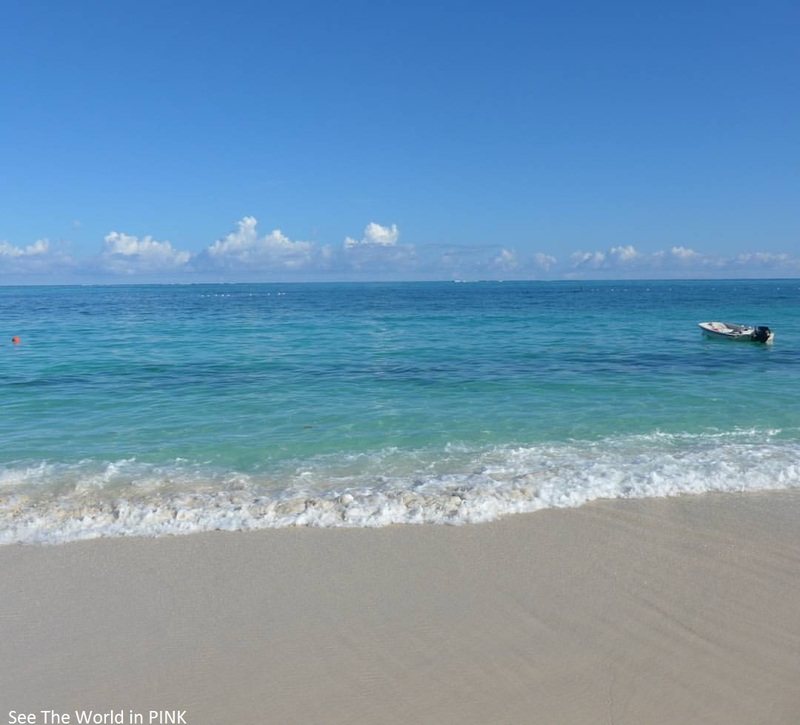 I will try not to take up too much space about it, but this picture is of the legendary Grace Bay Beach. The water is absolutely stunning and it just gets better. We actually island hopped from Provo to Grand Turk to Salt Cay and back to Provo! I was so happy with the trip, it's hard not to think about buying a vacation property on one of these amazing islands! It comes in a cute little pink box and is always nicely packaged! My poor nails and toes took quite the beating while in the ocean for 2 straight weeks - salt water does not do the nails any good!!! Also, I'm so sorry my picture quality is crappy - we broke both of our cameras while on holidays so I am only using my phone while I find an old camera to charge up! I am excited to get home to Fall and now my nails can be part of the season! 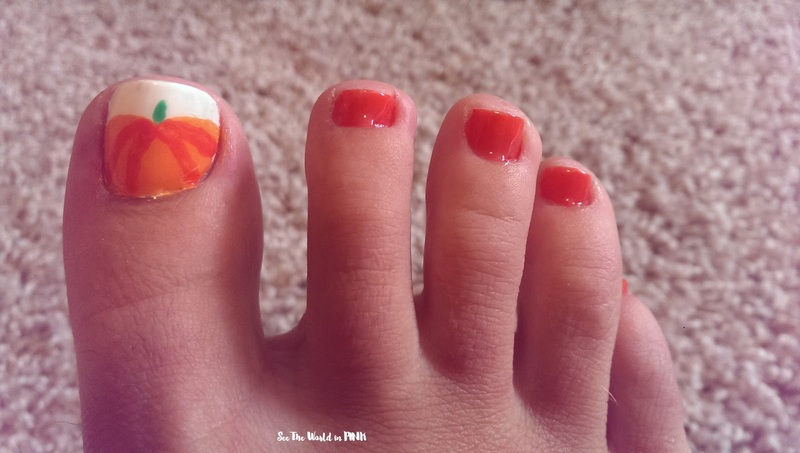 Here is my Monthly Pedicure - Pumpkin Nail Art Toes!